Posted by msoorya in News, Photos, Sports, Tennis. 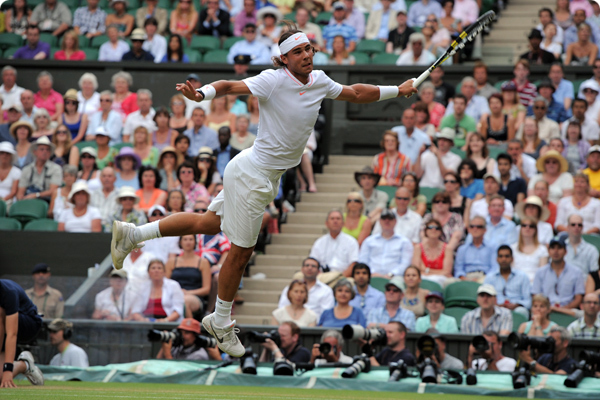 Rafael Nadal has now reached the finals of the Wimbledon Grand Slam Championships 2010. In the semi-final, he thrashed World No.4 Andy Murray 6-4,7-6,6-4. I thought initially that this match may go upto five sets. But, Nadal played really well today. He broke Andy Murray serve 3 times in the match. Andy broke Nadal’s serve one time in the third set. In a particular stage, Nadal was trailing 3-4 to Andy Murray, but he broke Andy’s serve two straight times to clinch the victory. I think Nadal is all set for another Grand Slam.. All the best for Nadal.. In the final, Nadal will face a person who beat the defending champion Roger Federer in quarter-finals, ya.. it’s Tomas Berdych. 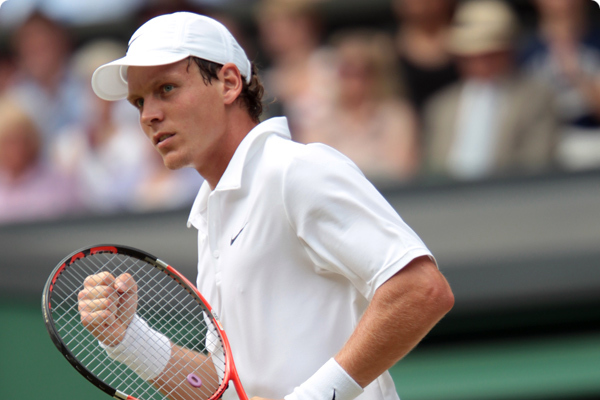 Tomas Berdych beat Djokovic in straight sets 6-3, 7-6, 6-3 to enter the final. Tomas is also playing really great and he looks out in good form now. I think Nadal is ready for any challenges.. The final is going to be action packed ride..
Go Rafa… Grass will also be yours..!! Posted by msoorya in Commonwealth Games Delhi 2010, India, News, Photos, Politics, Sports. Good news to spirited sporting fans all-over the country! Saina Nehwal, World No. 3 Badminton Player,already the first Indian Badminton player to win Super Series Badminton Title, also the first to clinch the Singapore Open Super Series title last week, clinches her third Super Series Badminton title today. She is really a 20 year old marvel from Hyderabad. She successfully defended her Indonesian Open Championship. In the final, she defeated Japan’s Sayaka Sato 21-19, 13-21, 21-11. It’s an hatrick for Saina who the Indian Open Grand Prix and the Singapore Open Super Series in the last 2 weeks. I am upset when she lost in the quaterfinals of the Beijing 2008 Olympics. But, she improved here form very much. So, I am confidently saying that gold in Commonwealth, Asian, Olympic etc., Badminton events will be ours! India and our people are switching gradually from Cricket to the real sporting events. We are improving a lot in all sporting events. If there is no corruption in Sports Ministry, we can improve at the fastest pace. There are many Saina Nehwals left unnoticed in our country. When they will come out? Games Village for the best ever Commonwealth Games to be hosted in our capital is located on the eastern banks of River Yamuna. This project is being undertaken by the Delhi Development Authority(DDA), which is an agency under Government of Delhi. It’s located off the National Highways 24 in the Noida Intersection near the Akshardham Temple. Games Village expand over an area of 63.5 hectare. It includes 14 blocks, 34 towers and 1,168 air-conditioned flats. It will have two occupants per room. All these facilities were the provisioned to deliver the best ever Commonwealth Games. These will provide world-class infrastructure for more than 8,000 sports persons and official from around 71 nations. 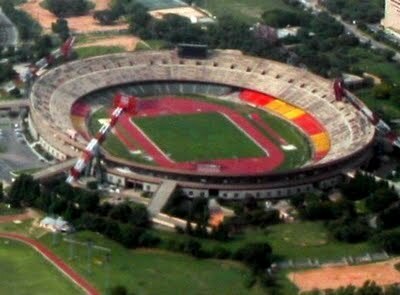 I am too excited on Googling about the Commonwealth Games Delhi 2010’s venues. They are very great. Some nations thought that India can’t accomplish this mission. But, they have to think again! . He is an exclusive slideshow for you! The work for the Games Village is started in August 2007. I don’t know whether the work is finished or not. But, I hope that it will be done right on time. Let’s hope for the best! The 10 days of Commonwealth Games will surely increase India’s level in the Global level. India will be on the center stage. It’s a good chance to showcase our potential. So, Indians please throw away the Gamble Cricket and start supporting the real sporting events!